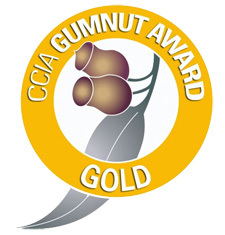 The Gumnuts Awards Program is a progressive rating scheme based on the environmental management of tourism businesses which was adopted and enhanced by the Caravan and Camping Industry Association (CCIA) of NSW. To create an eco-friendly and socially responsible park and thereby achieve recognition in the Gumnuts Awards Program, the park’s operations must satisfy criteria and benchmarks under the ten categories of:- Landscaping; Water and Wastewater; Solid Waste; Energy Efficiency; Air and Noise Pollution; Biodiversity Conservation; Economics; Staff; Local Community; and Safety & Emergency Response Planning. Clyde View Holiday Park has continually progressed through the Gumnut Awards Program, having attained the Bronze Award on September 9th 2003, and achieving Silver Gumnut status on June 2006. Since implementing the Gumnut Awards Eco-Friendly Parks philosophy, Clyde View Holiday Park has made alterations such as planting native plants, using less pesticides and fertiliser, minimising water usage throughout the park, reducing, reusing and recycling throughout the park and installing sensors on street lighting. These changes have enabled the park to adopt and develop the triple bottom line aspect to provide a realistic and progressive vision for the park. Clyde View Holiday Park has now attained, and is committed to maintaining our Gold Gumnut status, placing more emphasis on our environmental sustainability and social responsibility with the implementation of our Environmental Management Plan, which outlines the goals for the next ten years which will accomplish our vision of becoming part of the environmental solution, not part of the problem.